Knibbe, Ruth & McLeod, Natalie. Scanning electron micrograph, 2014. McLeod, Natalie. Staurosira Construens [lasercut acrylic, LED, aluminium channel; Rigging refined and constructed by Michael Jones] Wellington Museum of City and Sea as part of Lux Nightlights Festival, Wellington Waterfront, 2014. Staurosira Construens is a large-scale laser cut and LED lit acrylic pattern designed for exhibition as part of Lux, Wellington Nightlights Festival 2014, New Zealand. The imagery featured in the design is derived from scanning electron micrography of diatoms, minute photosynthesising algae found in fresh and saltwater, that I carried out with Dr. Ruth Knibbe of Industrial Research Limited. At high magnification microscopy of diatom samples showed individual complex geometric structures whilst at a lower magnification it displayed the forms piled and scattered like debris washed up on a shoreline. In this design I sought to capture and reveal the unusual geometry of the diatoms, and to represent a sense of their arrangement in space as I found them under the microscope: Large motifs are arranged in a traditional three-spot repeat layout commonly used to create multi-directional spaced designs, with smaller varied motifs arranged in a continuous scatter beneath. The layout of the large motifs creates the overall rhythm of the design and the background layer adds depth and interest, as a patterned ground would in a screen-printed textile design. The design of the work evolved in response to the installation site, a full height, glass-panelled corridor of the Museum of Wellington City and Sea, now Wellington Museum, which both defined and displayed the full drop layout of the repeat unit. The grid created by aluminium of the work and the window architecture emphasised the repeat structure that would usually be hidden in a printed textile design of this style. 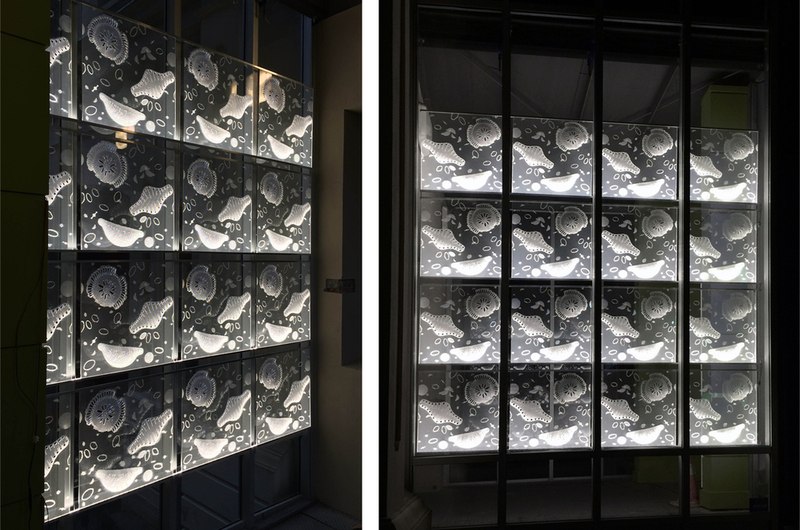 The installation highlights printed textile repeat design pattern methods through alternative technologies and materials, and suggests opportunities for laser cut repeat textile pattern on hard materials as lighting and as interior and exterior panels. The design shows captured microscopic imagery engraved at a large scale in a spaced repeating pattern, drawing attention to the individual motifs, but also hinting at a world of structures and patterns still to be discovered at other magnifications. With thanks to Michael Jones.